acCELLerate is a specialist for large-scale production and cryopreservation of highly functional assay ready cells. The instant use of cells from a frozen stock became a widely accepted approach which is preferred to the use of continuously passaged cells. 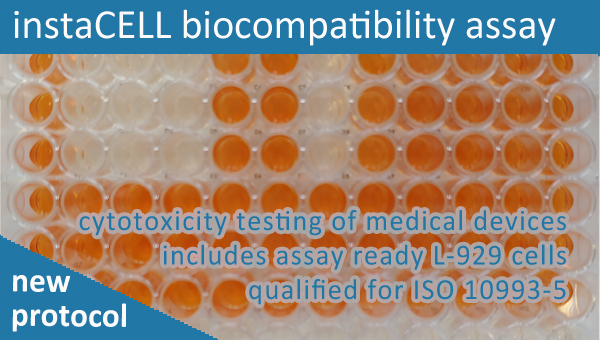 Today, assay ready cells are used manifold for the screening of new drugs and functional ingredient, the animal free safety testing of chemicals, and for the potency testing of biotherapeutics in clinical development and manufacturing control. Assay ready cells increase the flexibility of any cell-based project and can significantly improve assay precision. Based on 16 years of experience acCELLerate has developed freezing protocols and established well-controlled processes to prepare assay ready Frozen Instant Cells of high quality and robustness. Frozen Instant Cells can be used like a reagent without prior cultivation. acCELLerate provides assay ready cells from multiple cell lines, validated instaCELL bioassay kits, as well as custom cell banks of Frozen Instant Cells with comprehensive documentation to meet specific requirements of the different fields of application.